Nutritional supplements can help maintain health and prevent the onset of disease. Nutritional supplements can offer added “insurance” that one is meeting the daily recommendations of vitamins and minerals needed by the body. NC Nalcosamine may assist in the maintenance of joint mobility and the lubrication of joints. NC Lung Tonic is a natural herbal liquid formula to support lung health. reducing the clinical signs and symptoms of lactose intolerance. 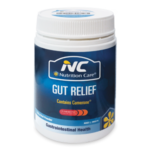 NC Gut Relief supports the health of the digestive system and assists to maintain gut health and function. Lactose intolerance is caused when the milk sugar, lactose, cannot be digested and absorbed. The symptoms of lactose intolerance include abdominal pain, abdominal swelling, flatulence and diarrhea. You are what you eat. And when it comes to your gut health, what you eat has a big impact on keeping you and your gut in good shape. Blood glucose is vital to the healthy working of almost all the cells in our body to supply them with energy.